The Bill Emerson National Hunger Fellows Program educates participants on local and national hunger and poverty issues, which help them discover alternate solutions and help rally political change. A year round Fellows Program starts each August, with 20 people from different parts of America. Emerson Fellows gain experience working in community based organization, as well as nonprofits and government agencies. Help with housing, a living stipend and health insurance are provided while the Emerson Fellows are in service. The deadline to apply for the 2013-2014 Bill Emerson National Hunger Fellows Program is January 14, 2013. Fellows for the Spring 2013 program, (March 3rd – May 27th), will be chosen by January 10, 2013. People's Grocery has a 3 month unpaid allyship program that is both hands on and educational. Each ally is taught about food justice through books, a film series and workshops. They can choose to work in either the California Hotel, Growing Justice Institute, Strategic Partnership or a Special Project for 20 hours a week. At the completion of the Food Justice Allyship Program, participants receive a People's Grocery Food Justice certificate. Fall 2012 Allyship positions are currently available. 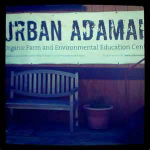 City Slicker Farms welcomes volunteers too!